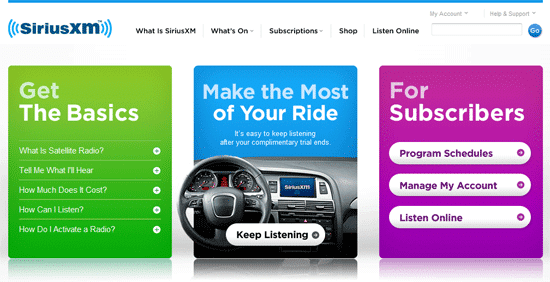 In a move that has been a long time coming, the Sirius and XM websites have finally merged. The new web presence can bee seen at siriusxm.com but, it should be noted that consumers can still get there via the older sirius.com and xmradio.com urls. The new design is geared toward subscriber retention and revenue maximization with key sections devoted to converting OEM promotional subscribers and helping new users to understand the service. The new website is also seems to have adopted simplicity theory as it is much easier to navigate. This latest move also includes an updated internet media player that incorporates social sharing and the ability to purchase music. Listeners can now tell the world just what they are listening to or purchase the song in a single click. The revamped player also includes a tuner dial that lets users see channels on the fly and connects them to specialize features. Want to see it in action? Check out the new media player tour. Clearly the website and media player still have some tweaking left to do but, it appears that Sirius XM is making some moves early in 2011 in preparation for Satellite Radio 2.0. More impressive than anything is the consolidation of the branding. With one unified website Sirius XM can get on with the business of ending consumer confusion and marketing one distinct brand. Hopefully the next move will be a unified customer service call center and unified billing options. This is perhaps the company's biggest shortcoming and is certainly on the schedule for upgrades and updates in 2011. An excellent move for the company! The site looks nice and clear very user friendly. The ability to purchase a song from siriusxm.com through Amazon.com and or iTunes is a new revenue stream for the company. Satellite Radio 2 should offer customers the ability to buy songs very similar to buying songs from iTunes through your smart-phone. I strongly believe that SIRI is going to make all those people holding for the next few years very rich! Would be excellent if you could buy the song, it is then cached, and can be played from car, computer,smartphone, etc.. via an online music locker room. Now, SiriusXm needs to merge all services and drop the best of Xm or Sirius package! Will Sirius subscriptors ever be able to listen to MLB baseball? This is an interesting one now because the deal was done with XM, but now XM is gone and absorbed into SiriusXM radio. MLB will not let them do that. Sirius tried by they got a firm “NO”. They will have to wait till the end of all remaining one year options expiring in 2015 that MLB will be exercsing. MLB certainly will never give such a sweet deal of a little less than $60M/year for 11 years. Contract with MLB was the worst deal ever done by any of them from any point of view. This contract will be the only one they seem unable to fix until it expires. Curly I agree! I also don’t agree with the Internet add on, that in order to have it you have to pay an addition $2.99 for it, when it should be included in the first place. The music journey ends when you arrive to your destination. It only makes sense to have that included in the first place. Also, why is the Internet Radio package costing $12.95?????? If it is exclusive to only computers and smartphones, why can’t they charge lower for that say $6/month or something? So it’s basically $16 /month then. I just don’t see a large amount of people wanting to pay $12.95 to have internet streaming capabilities alone. I wonder if Sirius can somehow emulate and monetize Pandora’s model, yet make it viable for Sirius and affordable for subscribers. Woohoo. The new media player works in non-IE browsers. I noticed that Firefox had all the same functionality as IE but, I cant get it to run on Google Chrome. Is it just me? I’m trying to hold off on expressing my true feelings because this seems like a soft launch to me. That said, the problems I see, seem like major design issues that can’t be simply tweaked. The old XM player worked in Firefox. Never used the Sirius one though. This just crossed my mind, another excellent feature would be to have a chat interface. If only their was an app for the Blackberry Torch, which has been out for some time now……ridiculous! Also would be so nice to have the option to disable the super annoying time-out non-feature!! Anyone else noticing frequent disconnects in the new SiriusXM online player? It will lose audio then I have to relogin and it’ll load. The SiriusXM app seems to disconnect frequently too. Sometimes it will come back automatically but other times I have to manually restart it. Yes, and it is frustrating. I hope they work the bugs out soon. There is nothing good about this new player. The functionality went waaaaay backwards on this. The developer should be ashamed! No longer pauses and resumes, it resumes live as the show is being broadcasted, unable to go back in the show and start from a previous spot. User interface is very tedious needing pinpoint precision to select a channel. Have to sign in every time now. Disconnects due to user inactivity. Well no SH_T! I’m listening to a show, how much activity do you expect! i will be canceling my subscription unless they change some things back. And don’t waste your time emailing. You will get the same redundant responses. It would be more impressive if the internet radio actually worked properly. Streaming frequently stops and skips mid-program. It is difficult to locate stations. Station labels never load on my player any more. I can’t believe they actually charge a fee to use the thing. There are free public station radios available online that cost nothing and work 110% better than this new piece of junk. I will be dropping service this week and I would discourage any new users from signing up for this. No wonder the company stock has taken such a beating. Tip: If you enjoy streaming radio and a variety of convenient channels then sirius/xm internet radio is not for you. I can’t believe there still is no app for the Blackberry Torch. Thousands of people with the Torch would pay a monthly fee to sirius if they would get off their lazy behinds and create an app. Way to drop the ball Sirius!